A. SK-N-LP cells stably transfected with pCMV-GFP or pCMV-CaSR-GFP were grown in serum deprivation media for 16 hours. They were then exposed to cinacalcet for 24 hours at indicated doses in the same media containing 0.5 mM CaCl2 . Total proteins were isolated from floating and adherent cells to conduct immunoblots. 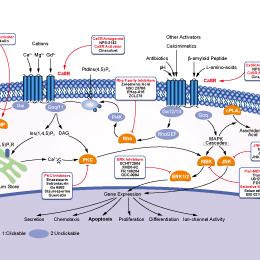 NPS-2143 is a novel potent and selective antagonist of Ca(2+) receptor with IC50 of 43 nM. The effects of a GPRC6A inhibitor on testosterone-induced ROS generation. Cells were pretreated with the GPRC6A inhibitor, NPS2143 (1 uM), for 30 min and ROS generation was monitored after 5 min of testosterone treatment. Data are presented as mean ?S.E. (n = 4).